My site is http://pornvilla.tv/ which i have started exactly a month ago. The server suggestions and installation guides by the script seller is followed as it is and the complete script has been bought with installation service on around 10th July and Admin got to it quicky and the site is setup and it's been live in the next few days. Admin is well behind me and supporting me with all his patience for all my newbie questions, and the site took off on around 14th July with all the installation done. As of today i am standing at around 900+ Users with around 500 Videos and slowly picking the site to it's good level. Will keep you all fellows here about the progress and in the mean time do suggest me with your ideas/feedbacks in what are the improvements can be done. I welcome all your suggestions and advices as it is. Yes, Don't know whats happening, i assume when i enabled the queued video option enabled i got this error and after that i have disabled it, and the videos are getting displayed correctly now. Are other videos showing in IE? If not, then its a bug and I need to fix it. Some of the videos still shows error and says stream not found too. Hope you come and rectify it. Today the site has crossed the mark of 1.5K users and 500 videos, Earnings are very low still. Really confused on how to tweak the earnings, Site now uniques at around 4.8-5.2K visitors per day. Planning to add some webmasters promotion with a nats site, have requested the admin already and will keep you all guys posted. In the mean time just let me know some idea on how to monetize ? check site unique visitors not visits and i think you have good rank to in alexa 280141. As my JA account got banned and i am not able to get one, any other ad networks would be much appreciated. Please let me know of the ad-networks which pays marginally well. You will need to do a lot of research to monetize your traffic. The majority of your traffic is from india, which wont pay good with PPC/PPS. You will probably need to send your traffic, once you have way more. yes, going to try with Trafficshop, Adexpansion, and Trafficholder soon. At present i am testing it with plugrush only, will keep you guys posted. In the mean time i would like to add a widget of plugrush in between the videos in the home page which may increase the CTR, can some body help me with this ? I can do it as a small project if you want. Yes, Please let me know the small project details, We will start and test it out. Hope you understand what my aim is and assume it will be a easy job for you. Yes, i understand what you want to do. Please send me a email. You can use the Contact Us form on our website and we will further discuss your project. So with that please include this project and add let me know the details for the Plugrush add integration between the videos as well. I have seen your tube link exchange site ad integration and it's pretty much awesome. A good milestone, As of today the site cloaked the 2.5K Users mark, Will be adding some features as i am back from a short trip. Will keep you guy's posted till then. Suggestions on improvements/additions will be always welcome. How to look for a trade ? Interested and let me know, do you provide any analytics ? Thanks for all that newxxx, Now i am looking to develop an android app for the site will it be possibile ? The app will just help the android users to browse the site in an app format, and all the updates will be synced and when it happens, In short an live website as a app. Will it be possibile friends ? Any developer ideas and what will be the cost for this ? Yet to take some modification from admin and going to take it soon. Thanks for that newxxx, and would like to get some advice in making the site mobile ready, the site is not opening at all in both the android and in iphone,ipad. Any suggestions on making the site mobile ready and increase the page speed score or offers to do so will be welcome. Suggestions for the above is required. Hope Ad is reading this regarding the google suggestions and would like to get it resolved and wish to reach somewhere close to 100 and make the site completely mobile ready. 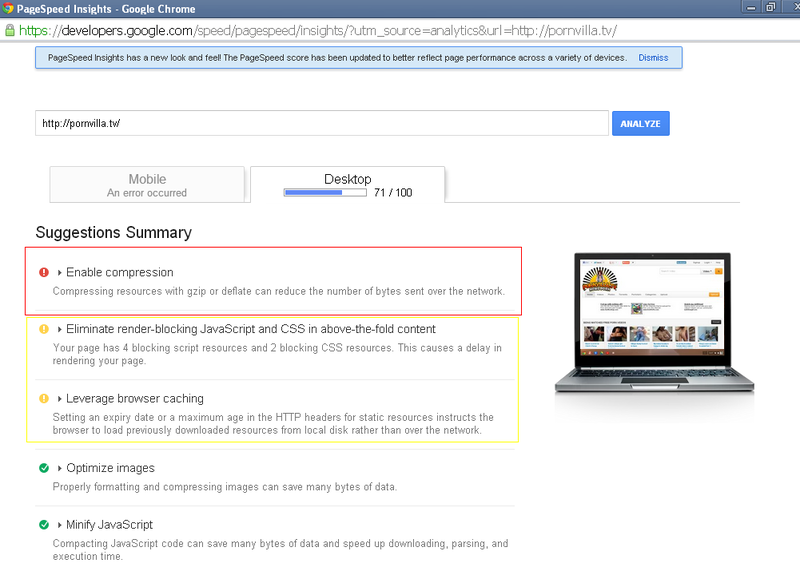 You can enable compression in the Web Server and css/html/js and other files will be automatically compressed. Doing this at the script level is not that good/fast. Your site should open in android/iphone and all phones, unless you've changed something in the code. I tested on my phone and it says this site contains to many redirects. Did you add any redirects for mobile? I have not added any re-directs for mobiles. As you only installed and setup the server. Regarding the google suggestions just tell me it's good to the site or not ? Here comes the 5K Users, Today the site cloaked the 5000 Users and growing steadily. Planning to add a Forum any advices would be appreciated. So now i have requested ad to enable compression and planning for the watermarking Mod. Planning to add a Scheduled Posts Release also all your suggestions are welcome.